Collecting data can be a chore. So much so that many business owners simply don’t do it. Unfortunately, data is the best way to know if your business is performing and provides a pathway for how to run your business in the future. Without it, you are leading your business blindly and hoping that your choices align with the data you are failing to collect. I used to be the same way about collecting data. As it seemed too complicated and time consuming, I simply failed to do it. This was a mistake. After seeing colleagues of mine grow their sales numbers at a fast pace, I finally gave in and began to find out what I needed as far as data. After learning everything I could, I came to the conclusion that sales data is the #1 most important set of figures that businesses should collect. Collecting sales data is the #1 most important set of numbers you need to collect. After all, this is why you are in business…to sell (product, service, etc.). Without knowing how much you have sold in the past, it is nearly impossible to accurately predict how much you will sell in the future. You need to keep track of your sales KPIs to close more deals and make your business grow. Anyone can make a prediction on sales figures, but the term “accurately” makes the difference between being employed or not. If you are unable to make accurate predictions, don’t plan on being around long (this includes your business if you are doing the predictions on your own). Future sales are based on logical data and without it you are going to fail. If you have made 100 sales in the first quarter of 2015 with 1,000 visitors (this can be website or brick and mortar), then you can see you have a 10% conversion rate. If you made 200 sales with 2,000 visitors in the 2nd quarter, you are on pace to maintain that 10% conversion rate. So, now that you know your conversion rate, you are able to make a prediction based off the number of “anticipated” visitors. If your historic data shows that you average approximately 1,500 visitors in the 3rd quarter, you can estimate 150 sales. This type of data lets you plan for inventory, employees, etc. 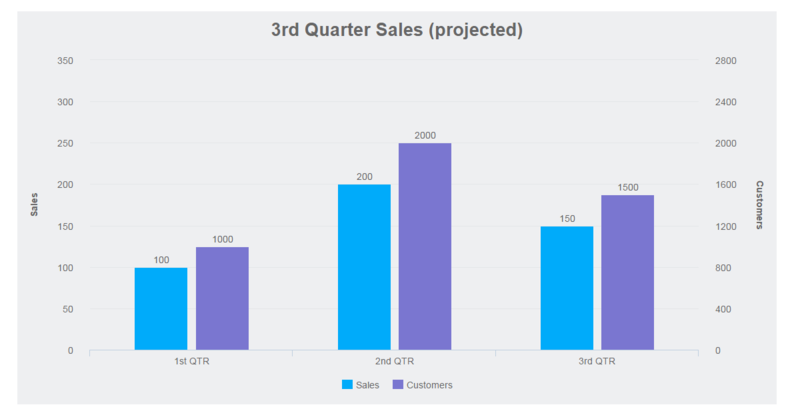 You can see how it looks in the graph above created with datapine’s data visualization tool. While data alone cannot help with conversion rates, it can help determine if you are on pace with your industry or not. Sales data such as conversion rates helps you know if your business is successful or not. Based on the previous data, you have determined that your conversion rate is 10%. Now that you have the data, compare it to others in your industry. If you are above the industry standard, congratulations. If you are below, then you need to find out why. This type of sales data helped me with my email marketing. Here’s how. I consider people signing up for my email newsletter a “sale” (i.e., conversion). Even though they have not purchased anything monetarily, I am able to sell them something (i.e., a monthly newsletter that allows me the opportunity to connect). When I initially began to collect the data, I saw that less than 1% of visitors to my site signed up. This was a poor conversion rate. Now that I knew I was doing poorly, I found ways to increase it. I added an email signup pop-up to the site, added a signup to the sidebar of my blog, and also made it a call to action in numerous blog posts. The results? You guessed it. An increase in conversion that has held ever since. So, without the above data, I would not necessarily know that I needed to improve. Ever go to a store that offers you their “discount card” or “loyalty card?” Absolutely you have. This is not because they are nice. They are collecting data to help increase sales. If you find that most people are buying a certain product on Saturday, then you would know the best time to advertise the product is Friday night or Saturday morning (taking to social media to remind these customers that the item is in stock). You will get more for your advertising dollars from this data as well. Discount and loyalty programs are one of the best ways to collect and correlate customer data with sales data. When I worked in the casino industry, “point cards” were the holy grail of marketing and promotions. The data collected allowed the casinos to know who was coming to the casino, how far they traveled, and the average amount they spent when they visited. When casinos determined that a group of people (based on average spend, distance, etc.) had not been coming to the casino as often, these people would be targeted for special promotions (free dinner, points on their card, etc.). Then, the results of the promotions were collected (again, more data) and tracked to determine if the promotion was successful. This article is just the tip of the iceberg on collecting sales data and should be used simply as an inspirational tool. I also recommend reading books on business intelligence. There are many reason why you should collect the data that are not included herein. In addition, each industry should tailor sales data to meet its own needs. An example is how I tailored mine to determine email signups. Finally, analyzing the data is just as important as the data you collect. Without properly analyzing the data, you simply have a pile of useless information. This is a guest post from Mike Wood. Mike is an online marketing expert and owner of Legalmorning.com. He specializes in reputation and brand management, article writing, and professional Wikipedia editing. Wood is a regular contributor to many online publications that have included AllBusiness Experts, Business Insider, Business2Community, and Social Media Today.